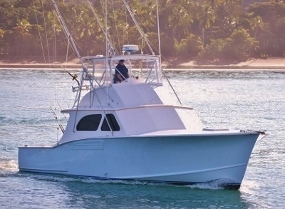 This 45ft Custom Carolina ‘Omie Tillet’ Sportsman powered by a 3406 Cat 800HP diesel engine and cruising at 23 knots, fishes out of Herradura Bay next to Los Suenos marina. Experienced American Captain Mitch Pierson is at the helm. She sports outriggers, downriggers, fighting chair, new bridge rail with eight rod holders, 315-gallon capacity fuel tank, and bridge seating on both sides of the helm. The boat carries a full complement of Penn reels and international-class rods, and has a fully upgraded air-conditioned salon; full bathroom and 100-gallon freshwater capacity hot water tank. There is satellite telephone, satellite TV, radar, Furuno depth sounder, a 2KW transducer that can see 8,000 feet deep, Furuno Nav system, Furuno 7000 plotter, Northstar 9000 plotter, Data Marine sounder, and Furuno screen. She will do overnighters, and day trip to Tortuga Island.